Linköping, Sweden and Toronto, Canada – April 10, 2019 – International medical imaging IT and cybersecurity company Sectra (STO: SECT B) will install its enterprise PACS solution at Trillium Health Partners. 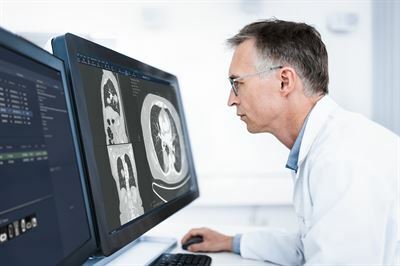 The system will provide radiologists across three hospital sites with unified access to medical images and a complete patient overview, resulting in more effective care. “As demand for hospital services continues to grow, we need a scalable solution that fits our organizational imaging strategy. It is important that we are able to provide our clinicians with tools that are easy to use and help them serve patients more efficiently. Sectra will allow us to meet these objectives and will enable us to continue to deliver high-quality care and exceptional experiences for our patients,” says Dr. Derek Archer, Medical Director and Chief of Diagnostic Imaging at Trillium Health Partners. Sectra will provide Trillium Health Partners with a shared solution across radiology, including breast imaging, integrated with their enterprise EMR. This will enable access and sharing of images and information across the entire clinical pathway and provide clinicians with a complete patient record. The system will handle approximately 600,000 examinations annually across Trillium Health Partners’ three hospital sites located in Mississauga and Toronto in the Canadian province of Ontario Canada. The multi-year contract was signed in April 2019. “It is important for us to work closely with our customers to achieve the best possible outcomes for their current and future needs. I look forward to a collaborative partnership between our two organizations,” says Kjetil Nilsen, President of Sectra Canada. Sectra’s enterprise PACS, as purchased by Trillium Health Partners, is a key component of Sectra’s enterprise imaging solution which provides consolidation of image handling, while ensuring clinical workflow efficiency. The enterprise imaging solution is modular and supports the most image-intense departments—radiology, pathology, cardiology and orthopaedics. Being built on the same technical platform, customers can easily extend a departmental solution to create a comprehensive VNA and enterprise image management solution without major investments or the replacement of existing components. Read more about Sectra and why Sectra PACS is “Best in KLAS” for a sixth consecutive year at http://www.sectra.com/medical/. Welcome to Sectra’s booth at Toronto Breast Imaging Conference, April 27, and MIIT Conference, May 10, to learn more about Sectra’s solutions.